I LOVE making tarts, savory or sweet. Certainly I make my share of quiches, but, honestly, I like anything in a pastry shell. My tart pan with its removable bottom is one piece of kitchen equipment I could never do without. An empty pastry shell is excellent vehicle for turning leftovers or random vegetables in the refrigerator into an elegant-looking meal. My go-to pastry crust recipe comes from Mark Bittman. Last week, by way of David Lebovitz, I discovered another pastry crust that you must add to your repertoire. This one is a press-in crust made from MELTED butter. The technique is unusual but oh-so-easy. You melt butter, oil, water, sugar, and salt in the oven until the butter browns. Then, you stir in flour and press the dough into the pan. The baked crust is incredibly flaky. The only caveat is that David doesn’t recommend using this crust for a wet filling. To test out the recipe, I made a beet green tart (sorry, no picture) and found myself falling in love with this crust. All week, I’ve been dreaming about other fillings to try. I was thinking about something with roasted zucchini, when the perfect inspiration came along. I had all the required vegetables from my CSA share, so I made Ratatouille Tian (from the delightful Clothide of Chocolate and Zucchini’s new book). This mélange of eggplant, zucchini, tomatoes, and onions is gorgeous to behold. Howard, of course, doesn’t eat eggplant or zucchini, but we had friends coming for dinner, so I had people to share it with. The tian made more than we could eat; more than half was leftover. 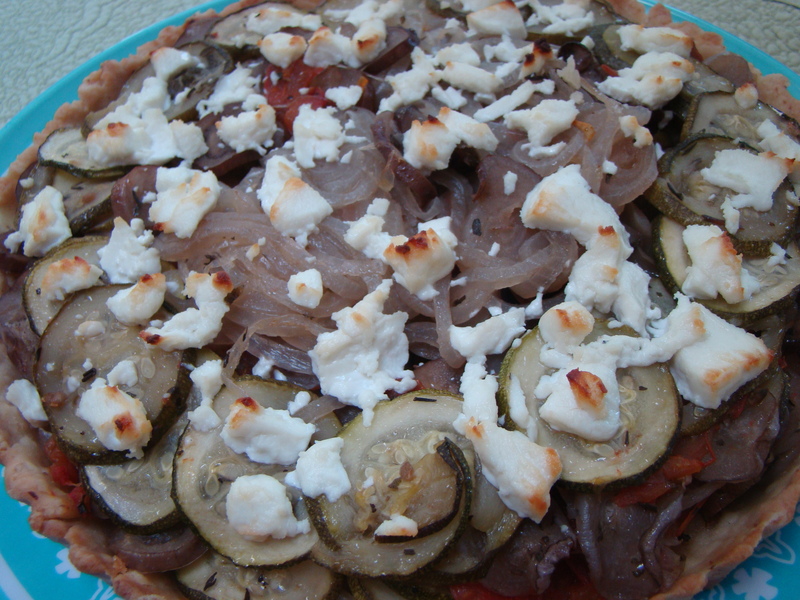 For lunch, I packed the leftover tian into a pastry shell and topped it with crumbled goat cheese for a Ratatouille Tart. It was everything I hoped for. What other summer fillings can you suggest I try? Preheat the oven to 350F. 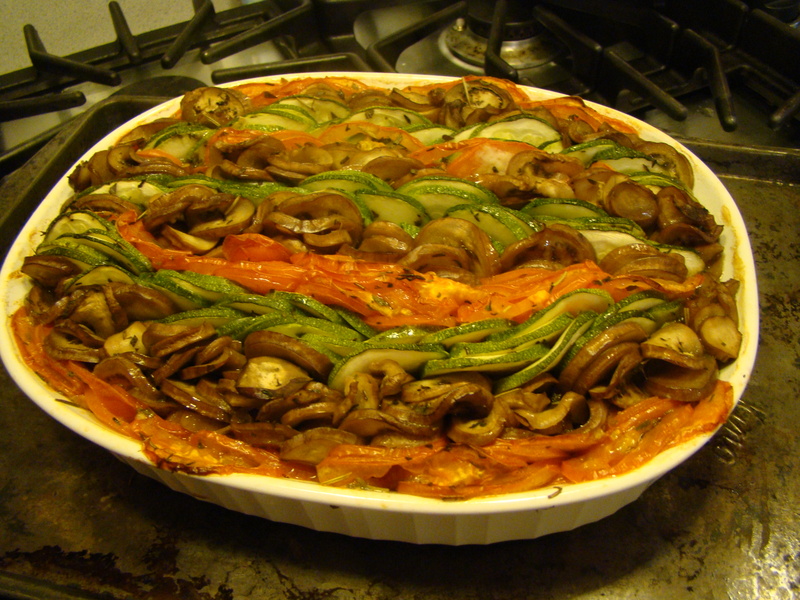 Fill the pastry shell with ratatouille, as decoratively as possible. Scatter the crumbled goat cheese over the filling evenly. Bake for 20 minutes, until filling is warm and cheese starts to brown. 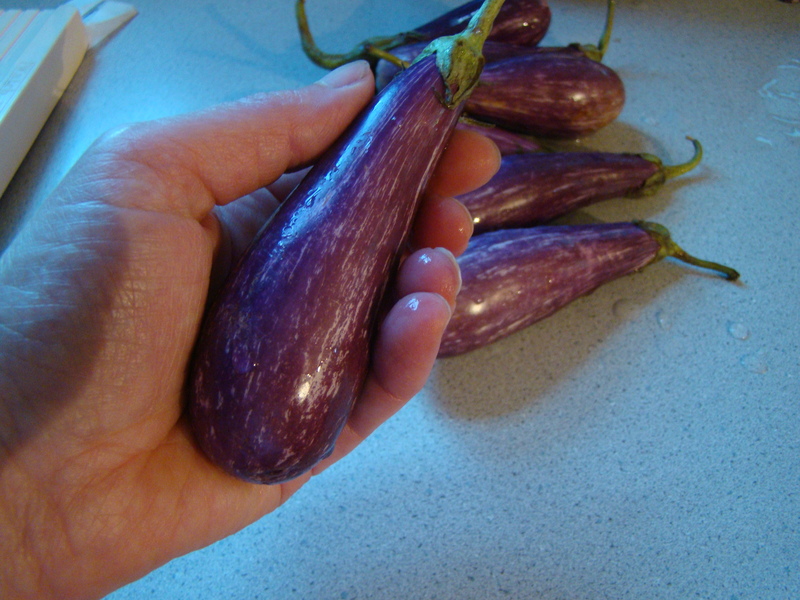 Fairy Tale Eggplant: So tiny, aren’t they cute? Another Friday, another recipe for French Fridays with Dorie. Each week, I have the best intentions of blogging about all the other things I make during the week. Summer produce is flooding in, and I’m cooking like crazy. Somehow I only have the time and energy to write and depict this one. 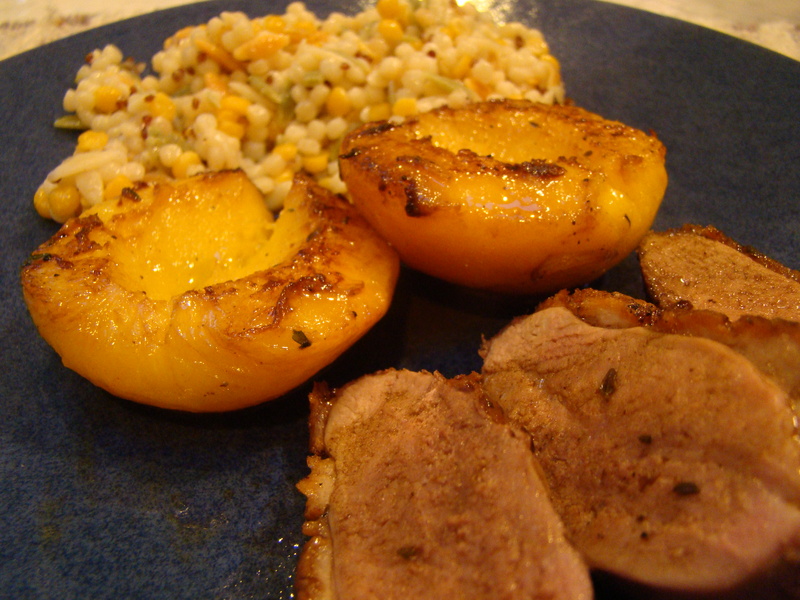 This week’s Dorie recipe is for Duck Breasts with Fresh Peaches. If you asked me to name my Top 3 takeaways from Around My French Table, one would definitely be the confidence of searing duck breasts at home. It was nearly two years ago, Friday November 4, 2011, when duck first appeared on the FFwD calendar. I had always been a frequent orderer of duck in restaurants, but for the first time, I realized that I could make this for myself at home, and quickly. A revelation for sure. I have made duck breasts many times since then. It’s replaced lamb chops as my go-to special occasion meal. With peaches at their peak, I was excited to try a new variation on the theme. By now, many of you understand the food quirks of my household. The name of this recipe indicates the problem. It’s not the duck, but the fruit in a savory dish. You know that Howard will not eat peaches with his dinner. Fortunately, the peaches in this dish are more of a side or hearty garnish. I was able to make a peach for myself and none for my husband. The sauce with its sweet and tangy blend of flavors offered no offense to his culinary sensibilities. I plated my plate with the delicious browned peaches, and Howard’s without. 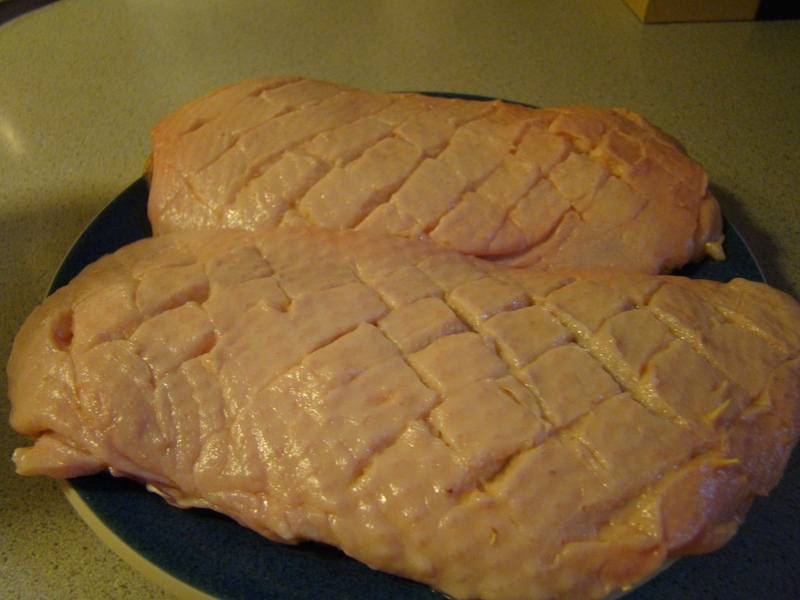 Cooking the duck breasts, scoring the skin and then searing them for a few minutes on each side, was as easy as usual. 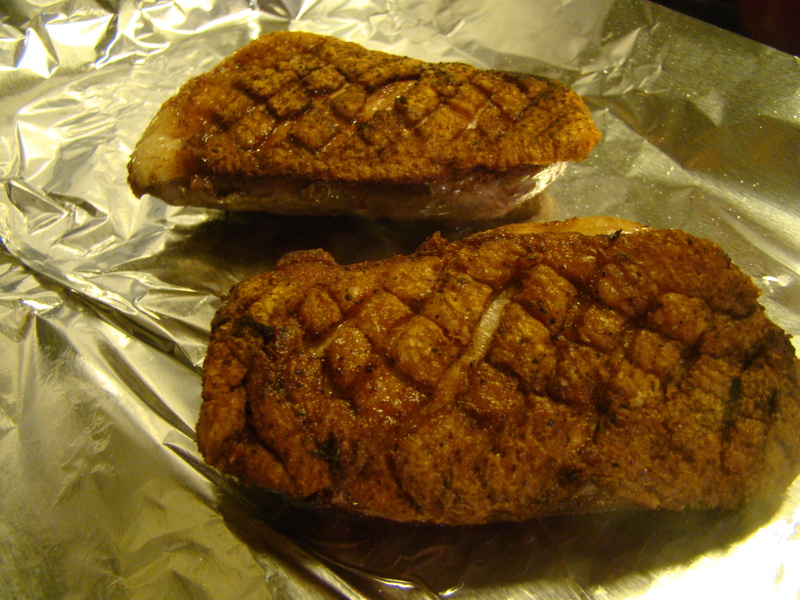 I like duck breast on the rare side, but I’ll admit that I overcooked it slightly, not perfect, but still delicious. I enjoyed the flavor and texture of the browned fruit. The sauce complemented both the meat and the fruit. On the side, I served Trader Joe’s Harvest Grains blend, a combination of Israeli couscous, colored orzo, quinoa, and baby chickpeas. Once again, I was delighted to be making restaurant fare in my own kitchen! 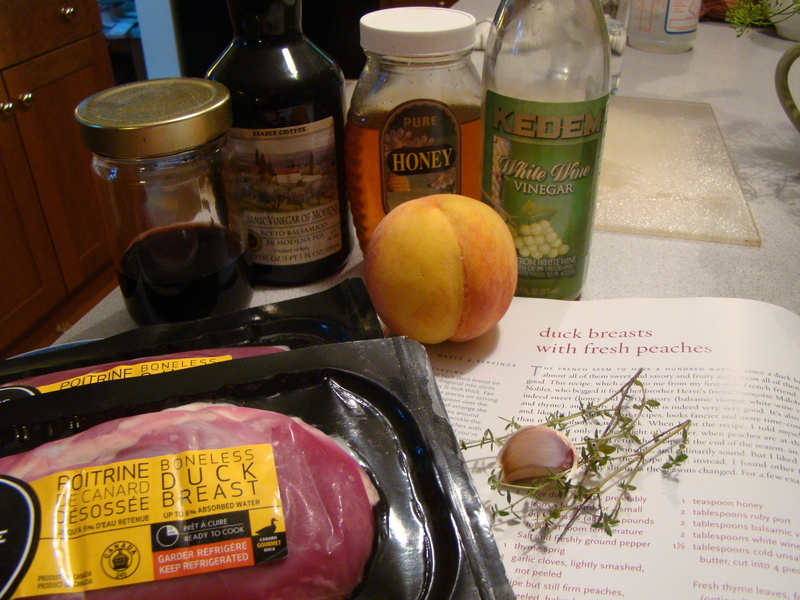 To see how my fellow bloggers did with their duck breasts and peaches, check out their links here. I can’t find the recipe on-line this week, but you can find it in Dorie Greenspan’s book Around My French Table.